Polk Audio N1 review | What Hi-Fi? 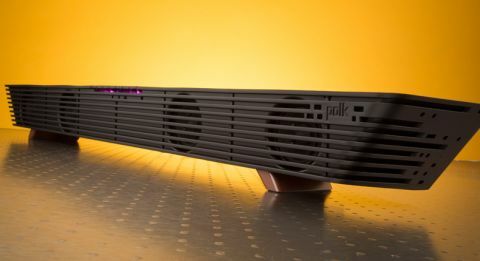 The Polk Audio N1 may have been designed as a ‘gaming’ soundbar (it has been engineered with game designers, is designed in-line with Microsoft’s Xbox consoles and has specific gaming EQs onboard), but don’t let this put you off if you’re a cinema fan. The N1 is a one-box soundbar (or ‘SurroundBar’ as Polk calls it) that will cover all your entertainment needs: movies, music and, indeed, gaming. In fact, any source that can be hooked up to the well-equipped bar’s optical, coaxial and 3.5mm inputs, or has Bluetooth compatibility, will work with the N1. And work well. The N1 is the first Polk soundbar we’ve heard and, if it’s anything to go by, we hope it’s not the last. Available in a black finish or a white and wood combination, the N1 is a burly unit: sitting on two feet, the trapezoidal bar measures 10cm tall (almost three times the height of the Humax STA-12000BSW) and 99cm wide – so it’ll fit nicely across a 42in telly, but will likely block the bottom of the screen in most cases. It’s not the most discreet bar to put in front of your TV – or on a wall for that matter – but, on the plus side, it’s rock hard when it comes to stability. Its plastic, shutter-like grille is relatively low-key, as are the springy keys up top that indicate commands through LED lights underneath. The ‘Learn’ button complements power, volume and source keys and can be used to set-up the N1 to respond to your TV remote in a few simple steps. It might be an idea to do that. The supplied credit-card style remote isn’t great; although it’s responsive, it feels cheap, and its colourful, icon-labelled buttons look gimmicky. The down-facing sockets are easy to slot cables into, although be mindful that their position near the bottom of the unit means cables with large plugs could get squashed against your TV stand. As its size might suggest, the N1 produces a big sound: open, spacious and with the potential to go pretty loud. It’s easy to be swallowed up in the movie you’re watching – even without any of its four ‘immersion’ modes (‘Forza Racer’, ‘Halo FPS’, ‘Cinema’ and ‘Music’) switched on. We fire up sci-fi game Destiny through the Sony PS4, and find ourselves engrossed in its post-apocalyptic world and epic orchestral soundtrack. Play Gravity on Blu-ray and the infinity of space is well conveyed. The N1 embraces the turbulent action scenes: crashes fill the room, and the soundfield displays breadth as debris moves across the screen. There’s nice clarity and weight to vocals, too, and a good degree of detail on offer. The midrange can feel a little ‘shouty’ though, so a bit of refinement wouldn’t have gone amiss here. Dynamically, the N1 shows good range; the obvious fluctuations in the film’s erratic Debris score are bold, although we’d welcome more subtlety. Despite no external subwoofer, there’s good heft to the sound as Clooney pounds against the space station; bass levels are decent in big explosions, too. There’s not the depth or definition in the lower frequencies that separate subs deliver. For example, the Philips HTL5140 and its sub do wonders for getting across the dramatic heartbeat effect that the N1 can’t (however, there is the option to add a woofer to the Polk if you’ve got the extra cash). The Polk Audio N1 entered the market at a rather steep £350, but a big price drop recently (it’s available for £200 now) makes it a talented soundbar for the price. Apart from the need for a more defined bass and slightly better refinement, you’ve got a top-performing soundbar, suitable for almost any source. If it fits in your set-up, the N1 should be yours.